It's spring break here in Texas this week. Though we didn't go out of town, my daughters are so excited to be off from school. Cherlin said she's thrilled to be home because she can help me do the cooking. Isn't she the sweetest??! She really enjoys helping me out in the kitchen, you know! She's only six but learning how to cook is something she really enjoys. Last weekend, she helped me bake Food for the Gods and chop some ingredients for Beef Caldereta for a friend's baby shower. After that, she said she's really tired and would love something cold for snack. This is what we made together. 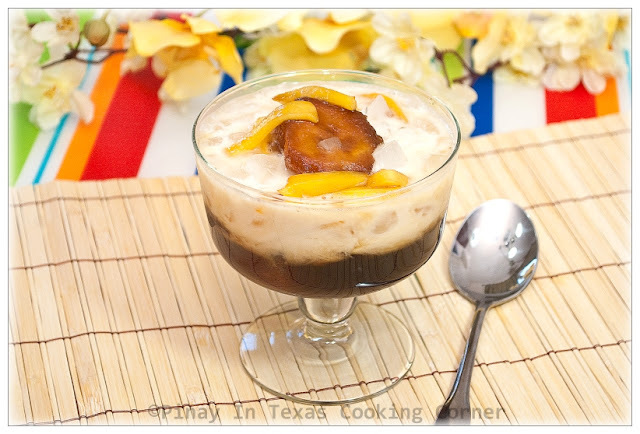 This is a favorite Filipino snack called Saba con Yelo. 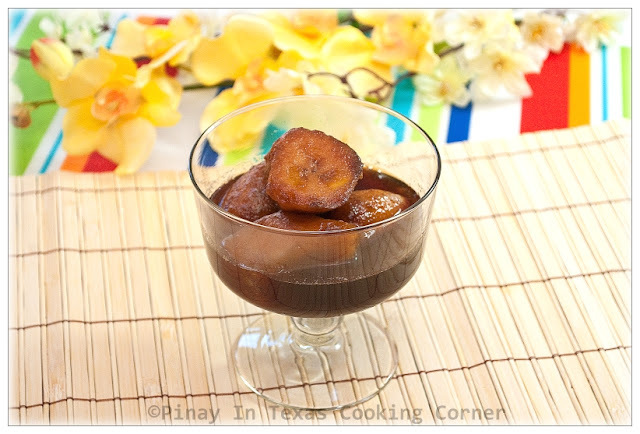 Saba is a variety of banana common in the Philippines and is very popularly used in snacks like ginataang halo-halo, turon, banana que, and halo-halo and in dishes like the pochero that I posted last Friday. Though I love just anything with this banana, the Saba con Yelo was my most favorite when I was growing up. I loved the thought of going home from school to this cold snack. My daughters, especially Cherlin, love this too. 1. In a saucepan over medium heat, bring water to a boil. Add brown sugar and stir until completely dissolved. Stir in vanilla extract. 2. Add Saba bananas. Cover saucepan and simmer for 15 minutes. Remove from heat and allow to cool down. 3. Divide bananas and syrup into 4 individual serving bowls. 4. Top each with ½ cup crushed ice. 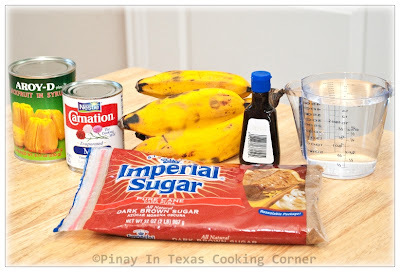 Pour about ¼ can of the evaporated milk onto the bananas. Top with jackfruit and serve. This looks like a nice sweet treat! Tina, would regular bananas be a suitable alternative? Although I grew up with jackfruit, I don't think I've ever tasted it. I may have to grab a can next time I go to the asian supermarket. Lyn, regular bananas can't be a substitute for this. It has a very soft texture so you can't boil it. This will work well with plantain bananas though. But if you really want to use regular bananas, you can just make the syrup, then mix it with sliced bananas and evap milk. :) There will be a difference in taste, but it will still be good! Cherlin's your little chef-in-training ! ;D That concoction's really refreshing and delicious ! Really missed eating that ! My daughter also has spring break. She is pushing me to make sweet treats. Tina I cook jack fruit(canned) as a vegetable. Which is this one which we can eat just like that? The unripe jackfruit is the one used as a vegetable and it is white in color. The one used for desserts and snacks like this is the ripe jackfruit which is yellow in color. 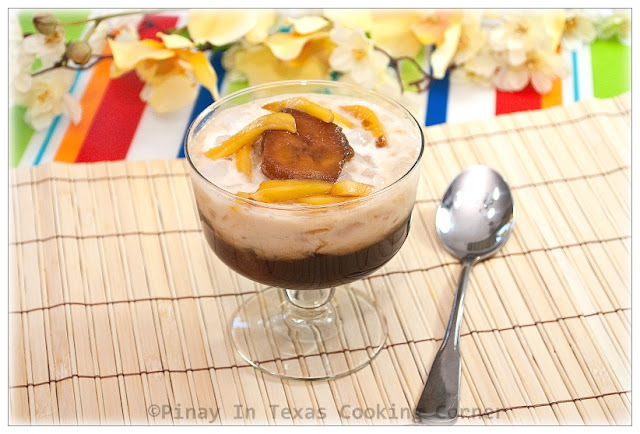 I have seen this dessert a couple of times from my other bloggers from Philippines. Nice conversion with banana and jackfruit for a simple yet looking lovely dessert. I love all the healthy information you continue to provide for your readers. Tina,What a wonderful time you had with your daughter,that's a nice thing :) and yes I love this dessert very much,it is similar with indonesian food we call "kolak" i bet jackfruits adding great tatse to it. Oh, I love that one of your sweet girls loves to cook! And what a yummy treat to make together! I don't think I had this type of banana but i seriously love the concept! I am so jealous that you have access to saba bananas! I can't find them anywhere, even at the GIANT international grocery store by my house - I always end up having to use ripe plaintains which is not the same thing at all. Either way - love this snack, it looks delicious! most of the recipes I looked at in your website are like mine. Love your technique, reminds me of my mom's. 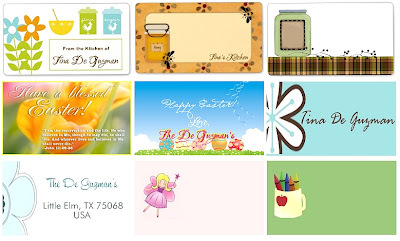 Recommending you to my daughter who just moved in Killeen, Texas last week.